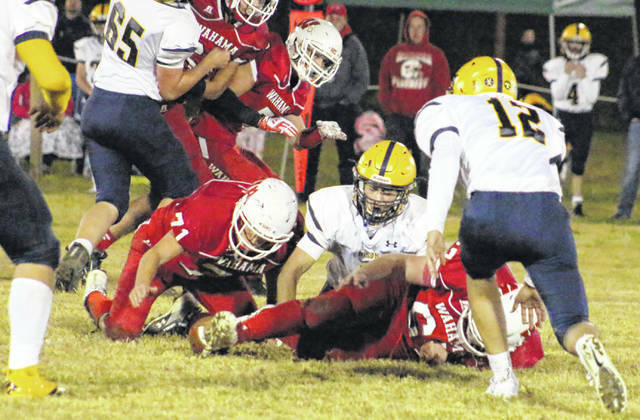 Wahama junior Wesley Peters (71) recovers a fumble, during the White Falcons’ season finale on Friday in Mason, W.Va. The Big Blacks finished the regular season in style on Friday, but they were the only Mason County team to do so. Point Pleasant (8-1) is headed into its 11th consecutive postseason with a 47-6 victory over visiting James Monroe (6-4) at Ohio Valley Bank Track and Field. The Big Blacks trailed 6-0 in the contest, but were ahead 26-6 by the midway point, and 47-6 by the end of the third. It’s the 11th consecutive year that Point Pleasant ends the regular season with a victory. During the win, PPHS seniors Cason Payne and Josh Wamsley set single game passing and receiving program records respectively. At Bachtel Stadium in Mason, Wahama (1-9) trailed non-conference guest Buffalo by a 13-0 tally, but cut its deficit to 21-12 by halftime. The Bison outscored the Red and White 21-6 in the second half, and the White Falcons finish the year with a 42-18 setback and a five-game skid. Hannan (0-9) ended its 2018 campaign with a 55-0 setback at Tolsia, in the first-ever meeting between the teams. The Wildcats — who’ve now lost 14 decisions in a row — trailed 28-0 at the end of the first period, 41-0 at halftime and 49-0 at the end of the third. Both Hannan and Wahama have completed their respective 2018 campaigns on the gridiron, while Point Pleasant waits to find out who, when and where it will play next weekend in the Class AA playoffs. Due to an early deadline, the Mason County football games from Week 11 will be available in the Tuesday sports edition of the Point Pleasant Register. The game stories will be available online at mydailyregister.com before appearing in print.